Put the butter and chocolate in a saucepan or microwave safe mixing bowl. If using the microwave, do an initial 1 minute burst, then stir thoroughly. Put it back in for 15 seconds, and stir again. The chocolate should completely melt as you stir. If not, do another 15 second burst. If you use the stove, keep the heat very low and stir constantly. Take off the heat and stir in the sugar and vanilla. Beat in the eggs, one at a time. Beat in the flour, then fold in the zucchini and walnuts. Spread in an 8x8 or 9x9 square baking pan, lined with parchment paper for easy removal, or grease the pan. Bake for about 25 to 30 minutes, checking on the early side. 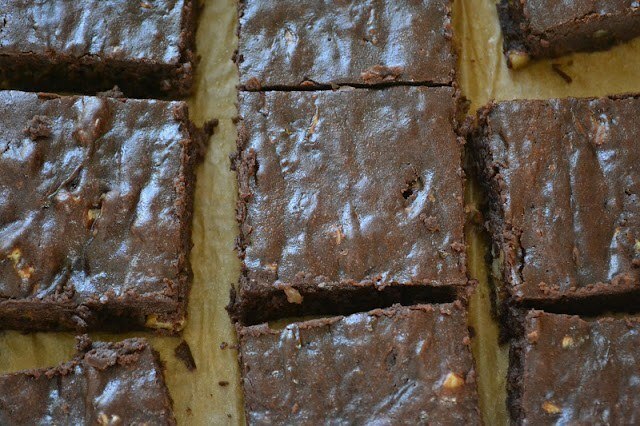 The brownies will look dry on top, don't over bake.